This recently updated 3 BR 1.75 BTH home is what you have been looking for. The exterior has nice cedar shake siding. Detached garage & landscaped fenced yard. 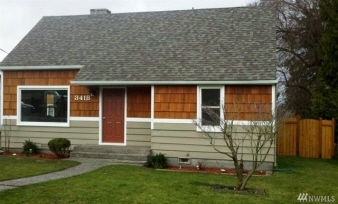 This beautiful home is conveniently located close to Link light rail and close to the airport. Updated kitchen with granite counters & tile backsplash. Maple cabinets and Stainless steel appliances with laminate floors with open concept to the living room. All Updated bathrooms. Master bedroom is upstairs with 3/4 bath and closet. DON'T COUNT ON THE MARKET; COUNT ON MY SKILLS.